Pride in Vancouver happens right smack in the middle of the summer. So although we at UCV are very proud of the fact we were officially certified as a Welcoming congregation for BGLTQ folk way back in 1995, we sometimes forget about planning to celebrate Pride Week. Last year when we did a vision survey, one of the comments struck me as significant: How would anyone visiting know about our positive support of queer issues? We have a tasteful certificate hung in the sanctuary, but even if you notice it, it’s pretty subtle. Unless you’re already in the know, you wouldn’t know that “Welcoming Congregation” status had anything to do with awareness and support of diverse genders and sexual orientations. North Shore Unitarians with the poster they created for their entrance way. They’ve generously shared the template and advice for when we decide to make something bigger. 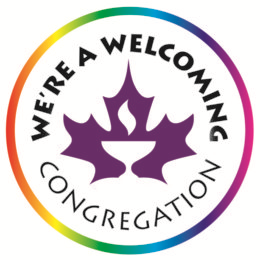 Recently the Board supported an initiative to work with the other three Metro Vancouver congregations to recertify as Welcoming Congregations and share ideas and commitment around celebrating Pride. We’ll be submitting an application to the West Bequest for financial support to produce and print a brochure and inviting speakers on educational topics into our congregations. To this end, we plan a couple of gatherings to share our own stories and discuss ways in which UCV can move forward. Our UCV group is just getting started, but I’m pleased to say that along with myself, Mary Bennett, Martha Saunders and Leonie Armstrong have joined our team. If you’d like to be involved or have comments or suggestions, please send to me for forwarding to the team. This year the South Fraser Congregation celebrated with bubbles at Surrey Pride. UCV Congregational photo that was sent to Orlando, Florida, showing our support. Because, as mentioned, the term “Welcoming Congregation” doesn’t mean much to any one who hasn’t already been involved in the Unitarian religion, we are considering a new and more explicit name for our team. 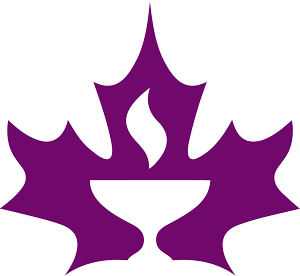 Many schools and universities use the term Gay-Straight Alliance, but since “gay” often has a more specific meaning than the umbrella term “queer”, I found on wikipedia that some “GSA” groups are now using the term “Genders and Sexualities Alliance” and one (Christian) school in Alberta–probably others–use Gender and Sexuality Acceptance. Beacon at New West Pride 2018. We will be doing some preparatory work over the fall, and expect to offer some workshops and presentations in 2019. Please do contact me with your suggestions or questions.